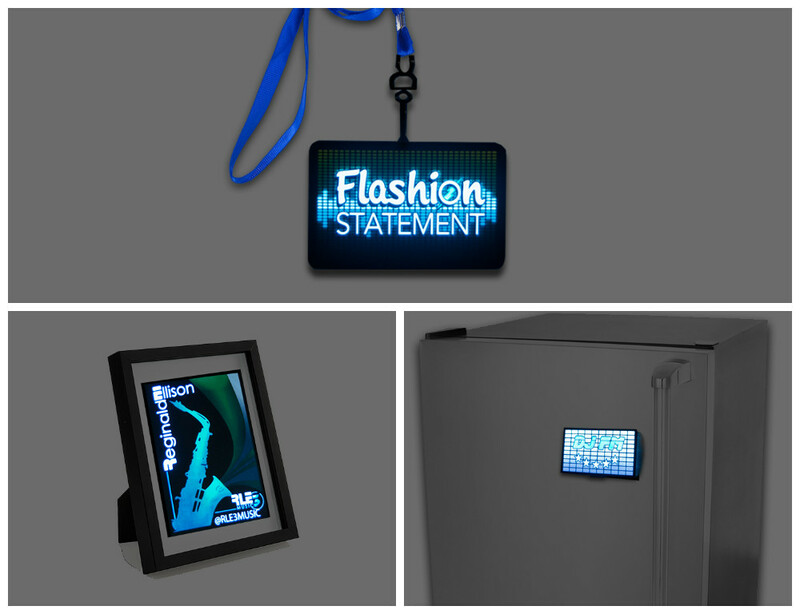 Light up panels use electroluminescent (or EL) technology to animate your logo, product, or message. Amplify your marketing efforts with these unique illuminated items. EL panels are made of a bendable vinyl material, thinner than a credit card, and is completely weather proof. We print your design onto the material, which when connected to power, illuminates using backlighting. Your design can animate in different sequences, or remain lit up statically. When using a wireless battery pack, the panels light up effortlessly with the press of a button. Using velcro or adhesive, you can attach them to anything! Step up the display at your next event with light up EL posters and signs. These eye catching posters are guaranteed to make your message stand out! Using a 12V wall plug, EL posters are incredibly bright and allow for more complicated lighting sequences. Light up panel posters can be made sound activated or flash automatically. Our EL posters can also be utilized onto your vehicle to create a one of a kind advertising product. The light up poster is powered through a 12V cigarette lighter adapter. Attach these to the inside of your car using adhesive or suction cups. Can be made with transparent background for better visibility. 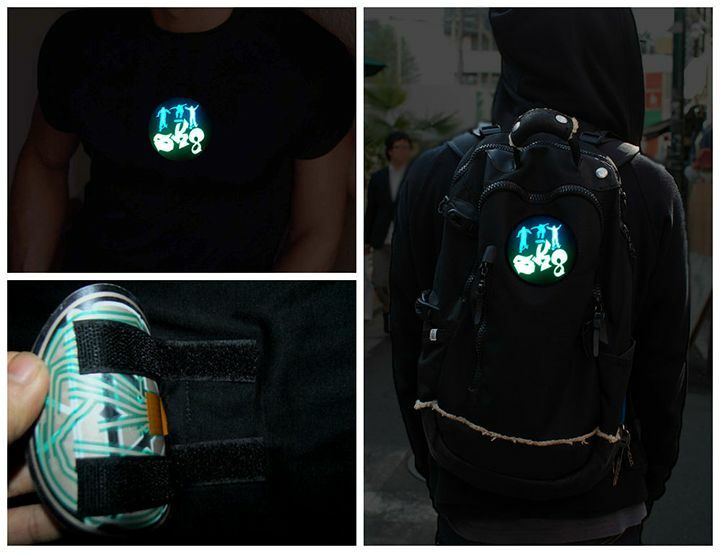 Using velcro you can attach the light up panel for seamless integration onto any garment. We have customers apply these to motorcycle jackets and vests, dance performance costumes, sports uniforms, and more. Great for added safety or flare! Since light up panels are so thin and versatile, there are countless other ways you can use these. We can provide a wireless battery pack and lanyard to light up your logo over a dress shirt, or incorporate a poster into an aluminum frame. Get creative and add magnets, hanging pins, and anything else you can think of. We'd love to help make your dream product come alive with our EL panels. 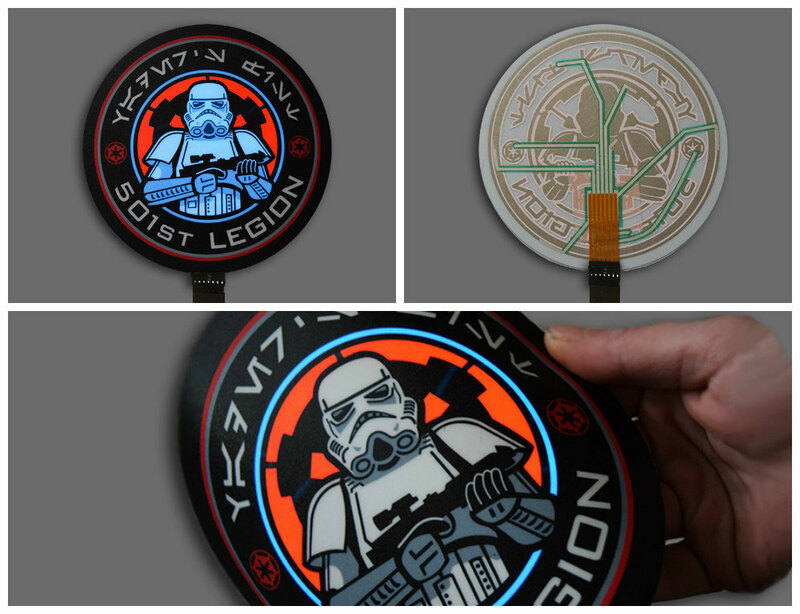 To customize our standard light up panels using battery packs, we require a minimum of 5 pcs. We do provide discounts based on the quantity order. Feel free to download our full pricing list. Please note our light up posters and car panels have no minimum, and you can make as little as one. These are quoted individually based on size, quantity, and the area being lit. Production takes 14 business days not including shipping, beginning the business day following payment. How big can you make the panels? The panels can range in size depending on the type of inverter you are using. Our standard 2 battery packs allows the panel to be 7″ x 7″ or 8″ x 5″ depending on your design dimensions. We also have a larger 4 battery pack that allows your design to be 9″ x 9″ or 10″ x 6″. When using a 12V plug, we can make displays as large as 5 feet. How small can you make the panels? The smallest possible panel we can create is 2″ X 2″. This would be a great option to add your logo to the front left chest of your garment. Do the light up posters use a battery pack? If a panel is larger than 10″ x 10″ the product requires a 12V wall or car plug. The battery pack is not strong enough to power a large display fully. A 12V plug allows for maximum brightness and more frames of animation. You can use this form to submit a high resolution file such as .JPG, .GIF, .TIFF, .PNG, .PSD, .AI, etc. Any large resolution image will work great. Feel free to include as many colors in your design as you want for no additional cost. Our design team will provide a free animated mock up to show the lighting sequence of your design. Please fill out this custom order form in order to receive an official quote and free animated mock up from our design team. You can make approval for the design on the quote directly, and then will be able to submit payment. You can pay for the order using your credit or debit card via PayPal (you do not need a PayPal account). Our main headquarters are located just outside of Providence, Rhode Island.